Hi guys! I'm introducing something new today. I was invited to participate in a small nail art group called the Digit-al Dozen. This is quite an honor as I've followed (stalked) many of these talented ladies' blogs for awhile. So I'm super excited to be a part. The second week of every month (Mon-Fri) everyone in the group will post five manis based on a theme. This month's theme is appropriately "holidays". At the end of each daily post, I'll provide a link to the other Digit-al Dozen creations. Please check them out! 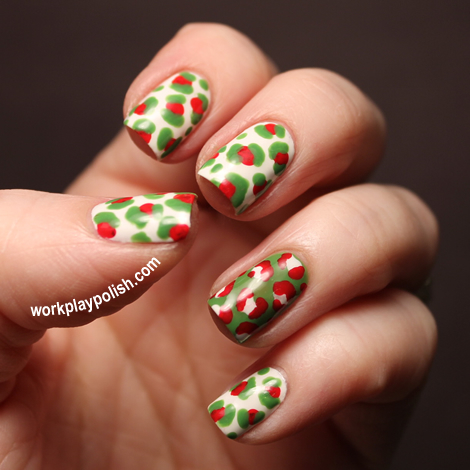 For my first themed mani I have what I call "Christmas Leopard". (My daughter said it looks like holly berries.) 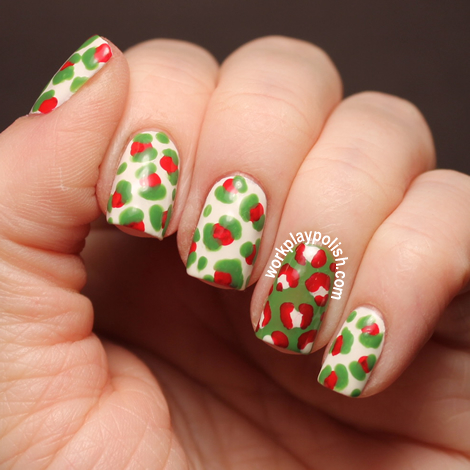 I used all OPI polishes, Alpine Snow, OPI Red and Green-wich Village. I think this look is fun and definitely super easy! Psssst...check out the banner to the right. 1,000 FB Likes Giveaway starts this Friday!! Be sure to click the link below to see the rest of the Digit-al Dozen masterpieces and show these gals some love!